Studium: Tijdschrift voor Wetenschaps- en Universiteitsgeschiedenis | Revue d’Histoire des Sciences et des Universités is an open access peer-reviewed academic journal which publishes articles and book reviews on the history of scholarship, science, medicine, technology and universities. 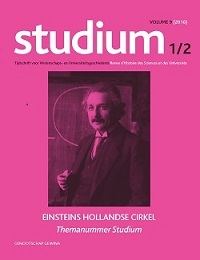 Studium is the official journal of GEWINA, the Belgian-Dutch Society for the History of Science and Universities, founded in 1913. Studium does not limit itself to a particular period or field, though it does give special attention to the Low Countries and its former colonies.